VpCI-386 Aluminum is a unique water-based primer/topcoat that successfully provides protection in harsh outdoor unsheltered applications. The complex mixture of non-toxic, organic inhibitors, and an aluminum pigment offers protection that can compete with most paints and zinc-rich primers. VpCI-386 Aluminum is superior to many coatings with only inorganic pigments. The resistance has been improved by using a highly corrosion resistant aluminum platelet type pigment with organic corrosion inhibitors. The special combination of additives provides a composite polymer barrier that significantly retards the reaction of metal ionization and repels water. A protective film is adsorbed onto metal surfaces. It protects against corrosive electrolytes and aggressive environments, thus preventing corrosion. VpCI-386 Aluminum provides a fast-drying thixotropic coating that is resistant to sagging or running, forming a tough non-flammable protective barrier. This dry-to-touch film offers extended protection for sheltered, unsheltered, outdoor, or indoor conditions. Thermally stable when dried from -150°F to 350°F (-78° to 180°C). The coating is ultraviolet resistant. It gives optimal outdoor performance without cracking or chipping upon prolonged exposure to sunlight. VpCI-386 Aluminum has exceptionally good anti-abrasion qualities, making it easily adaptable to steel grating walkways, steel decks, and numerous other applications where abrasion is to be expected. This coating is supplied in a single component. Power agitate at low speed to a uniform consistency using a "squirrel cage" type mixer, hand-held drill mixer, or other equivalent method. VpCI-386 Aluminum can be used as a topcoat/primer. When solvent-based topcoats are applied over VpCI-386 Aluminum compatibility must be checked. 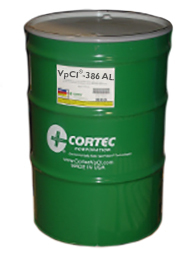 VpCI-386 Aluminum can also be used as a topcoat with Cortec® VpCI-374 or VpCI-395 as a primer. Note: Make sure dew point is more than 5°F (2°C) less than air temperature for application and the temperature is at least 55°F (13°C). VpCI-386 Aluminum can be applied via spray, roller, or brush. Fluid hose should be 3/8” (0.95 cm) I.D. with a maximum length of 50 feet (15.2 m). Pot should always have dual regulation and be kept at same elevation as spray gun. Hose should be 3/8” (0.95 cm) I.D. minimum, but a ¼” (0.64 cm) I.D. whip end section may be used for ease of application. A maximum length of 100 feet (30.5 m) is suggested. Best results will be obtained using a 0.013”-0.017” (0.3-0.4 cm) tip at 1200-1700 psi (83-117 bar). Note: Nylon or Teflon type packagings are available from pump manufacturer and are highly recommended. Note: Similar equipment may be suitable. Available in 5 gallon (Cortec Product # 12400508) or 55 gallon (Cortec Product # 12400515). 5 gallon drum weighs 50 pounds and ships under our standard shipping rates. The 55 gallon drum must be shipped by truck. We will provide you with a freight quote before we ship this product. Keep product from freezing. Avoid temperatures higher than 75º (24ºC) while in storage.